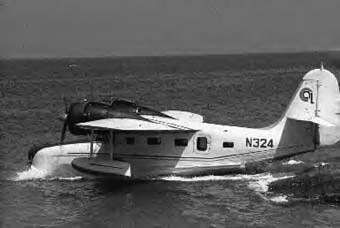 The Grumman G21 Goose was produced from 1937 to 1946. How many of you knew about this airfield at Diamond, St.Vincent? Photo probably taken late forties by "CVD". My first visual experience of the Grumman Goose was at the little airport at Villa. After one boarded the plane, it went down a ramp into the water, made a right turn (west) and taxied down the channel between Young Island and the Aquatic club. It turned around and then thundered east towards the reefs before taking off. 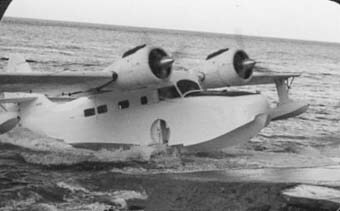 Would not that kind of thing have a great tourist appeal today - landing in the water and taxiing up some beach? My first flying experience was in a Goose in St.Georges Grenada: a rowing boat took us out to the plane and the rest is history. If You Ask Me: What does SVD mean? This is the question that I asked of my late father. If anyone would know, surely he would. This trivia question has also run through the minds of millions of people over the past decades as they head to or ship items to St. Vincent & the Grenadines. "St. Vincent, Diamond" was my father's reply. Of course! Duh! Everybody knows that Diamond, on the Southeast Coast, was the location of SVG's first airport, hence SVD. Er, well, actually, no, not everybody. In fact, very, very few people know or remember this pertinent fact. man-made wooden bridge that spanned the river running down to the sea, and came to a stop in front of the terminal building dispersing its extremely gracious and lucky passengers. rumble down the grassy runway to the east, heading literally down the slope of the valley to the sea, and then lift into the trade winds and fly away, usually to Barbados. This went on from the first flights to St. Vincent of the new-fangled invention called the airplane, sometime around World War I through World War II, for about 20 to 25 years. "Mr. Cato's home" in the corner all the way past what is now the Iguana into and around the Calliaqua bay; now the water slams into the properties, the entire beach having been washed away. One day my Grandmother was standing at the very end of the Aquatic Club jetty, presumably either waving someone off or just looking at a departing seaplane one day, when something went very wrong, and the plane careened out of control, heading straight for her and a certain crash. Fortunately, the pilot gained control and headed the plane towards a clear area but had to effectively crash land the plane anyway. I gather everyone was okay and the plane was pulled up onto the beach where Fantasea Tours is now, just to the west of the Aquatic Club. horse racing track/garrison. The what?! Yes, horse racing track! There is no horse racing in SVG today, presumably a casualty of the airport being built there, although I can only assume that if there was a big demand for such, a new track would have been built by now. I do not know who said what, who influenced whom and what engineering went into it, but the decision was made to build an airport in Arnos Vale. Imagine the confusion and opposition to such a move. I am sure that there was a lot of debate and opposition to such development. "Where will we grow our sugar?" "What about the horses; the noise will scare them" are, I am sure, just the tip of that iceberg. Meanwhile, over in SVG, the new SVD airport took shape and was opened as the Vigie Airport in Arnos Vale in the early 1960's; and yes, the "highway" ran right across the runway. lights which would indicate the all-clear to the barrier-men, who then walked the bamboo poles back across the road, allowing cars to proceed across the runway, and on their way. that has Vincentians around the planet discussing the pros and cons of whether or not to build a "cross country highway". Some say 'no way'; it will affect the environment, use up scarce financial resources, open up the forests to man's building and other exploits and intrusion onto the watershed areas; plus no one ever wants to or needs to drive directly from the Upper Windward side to the Upper Leeward side. Others say that we should 'use the money' to build the international airport first, then consider The Road. The Road will cost fifteen to twenty million dollars; The Airport hundreds of millions, no comparison. problem, notwithstanding the absolute cost and financing issues of the airport, which would have to be built by moving an enormous amount of land and earth, mountains and valleys Question: Which first? Chicken or egg? Airport or Hotels? Answer: Airport first! - Hotels, chickens and eggs will follow! So, will SVD ever become an International Airport? Are recent announcements by the Government that Diamond/Argyle International Airport is perhaps in our collective, near future mean that the airport is moving back to the South East Coast, from whence it came? Is Arnos Vale the future capital of St. Vincent & the Grenadines? Will we ever drive directly across the north of the island, without barriers, bamboo or otherwise? Whew! Decisions! Decisions! Never say "Never"! Attitude is everything!